Just a reminder that you can still download our recent briefing paper, supported by SAP Ariba, which is all about Procurement with Purpose. It’s full title is “Making a Positive Impact on Organisations, Human Rights and Communities” and is available to download now, free on registration. “Procurement with Purpose” broadly means organisations using their third-party spend to support causes that go beyond the immediate needs and operations of the firm – whether that might be carbon reduction, supporting diversity, encouraging local enterprise or reducing plastic waste. Here is another excerpt from the paper, in which we explain five points that organisations should consider if they want to pursue the idea of Procurement with Purpose. Here are the first two of those, but we do hope you will read the whole paper and find it useful and interesting. What should organisations and procurement leaders consider if they want to adopt more of the ‘procurement with a purpose’ ideas? Here are five points to consider. Look on this topic as one of risk and opportunity. As shown by the Co-op example earlier, smart organisations consider how they use ‘procurement with a purpose’ to build reputation and performance by “doing the right things” in terms of their supply chain management. That will resonate with customers, staff and other stakeholders. Equally, ‘procurement with a purpose’ must be mindful of the need to handle risk well, as so much of an organisation’s total risk exposure these days is generated from the supply chain and suppliers rather than internally. Taking a big-picture view of how these ideas can bring benefit to the organisation, and looking at this as a long-term commitment, not a short-term tactical activity, is important if the organisation really wants to make an impact in its chosen areas, and to gain the resulting benefits. 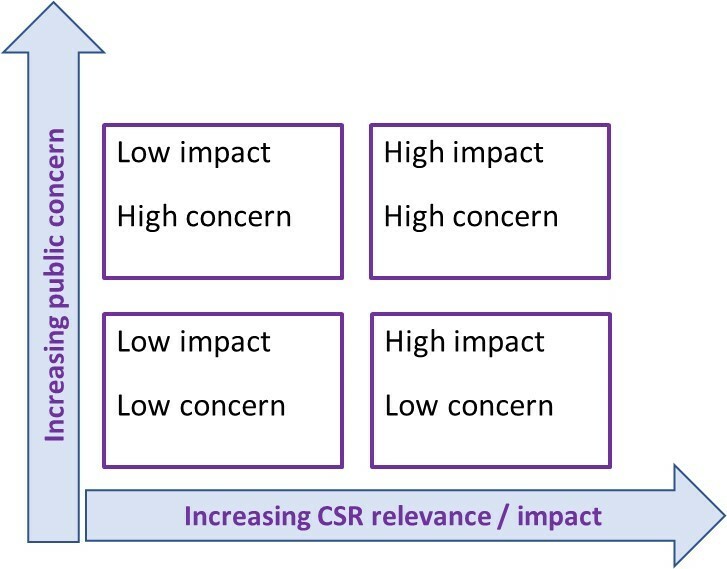 As Table 1 shows, there are dozens of different issues which organisations can consider within the heading of corporate social responsibility or procurement with a purpose. Beyond doing whatever is mandatory through regulations, organisations need to look carefully at where they want to put the most effort. It is impossible for anyone to address all of these to the maximum extent. That choice should relate to what stakeholders and citizens care about, and where the issue has relevance to the organisation and it can have an impact. Some organisations develop a materiality matrix – see below – to map issues and develop priorities areas to address. So if the firm’s core business is producing non-recyclable plastics, which is also a high-profile issue for consumers currently, then it would seem obvious that the major effort should be on those issues, rather than perhaps on de-forestation in Indonesia. But if the firm is a food manufacturer, then de-forestation for palm oil production is an issue where it could have a real and positive impact. A construction business might decide to focus on how it can help local young people, by offering apprenticeships or jobs for disadvantaged individuals – and encouraging its own suppliers to do the same. Choosing areas of focus carefully will increase the chances of making a real difference.